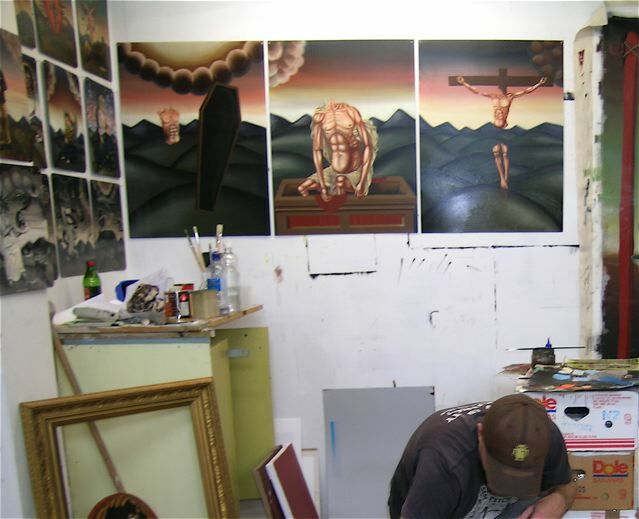 The three paintings on metal on the back wall of this photo are the main works that I'd like to complete before leaving New Zealand in July. They feel like they are possible keepers - I only feel that now, as they come from a long time ago in a conceptual developmental sense; physically they've been around for quite a while (since the end of 2009) and I'm happy to take one off the wall, add to it, place it back on the wall an just let it set there - wondering what they will possibly look like once they are finished. I painted the body in the painting on the left during the filming of The Gravy episode (you can see it at the 2-minute mark in the film). I was painting it for the camera so it was rushed, meaning I'll have to repaint it to get it up the the standard I want. Even though I don't know how they will ultimately look when finished, I know that I want them to be a triptych, the heads will be buildings and each work will need individual dynamism, yet work as a whole. Now that we're physically and mentally 'in transit', perhaps the works will take a different direction. That's enough to stress over at present.